Amidst recent Palestinian violence in Jerusalem and the West Bank which has claimed the lives of four Israeli civilians over the course of three days, another story has been making the rounds – the claim that Israeli settlers shot a 6-year-old Palestinian boy in the town of Qalqilya. However, the story was almost immediately revealed to be a hoax in, of all places, Haaretz. 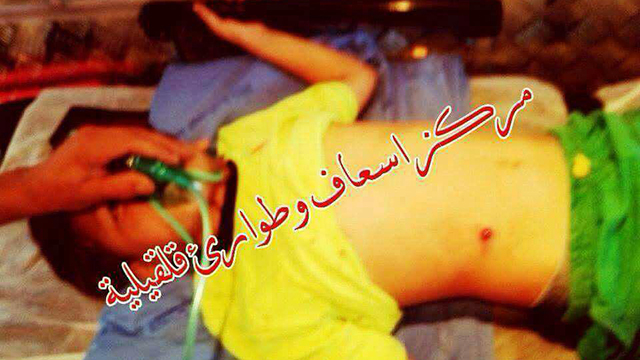 A six-year-old Palestinian boy was shot in his stomach near the West Bank city of Qalqilya on Saturday. According to an Israeli investigation, the boy was playing with a gun when it misfired, injuring him. Preliminary Palestinian reports said the boy was shot by an Israeli settler who drove by the village and fled after the shooting, but Palestinian sources said the family may have lied to protect the boy’s older brother, who was present at the incident, and in order to be recognized as victims of settler terrorism by the Palestinian Authority and receive a stipend. The Israeli military vehemently denied any Israeli involvement in the incident, and detained the older brother for interrogation. According to Bian Al-Tabib, the boy’s father, 6-year-old Youssef was with his 18-year-old brother alongside the main road from their village of Izbet Tabib when the incident happened. He said the older brother told him that the young boy suddenly fell to the ground, bleeding profusely. When he looked up, he told him he saw a car with Israeli license plates speeding away. However, the father noted that there were no other witnesses to the event. Kate Shuttleworth, in a story published on Oct. 4th (a day after the Haaretz piece) about the two recent stabbings in Jerusalem by Palestinians which killed two Israelis, added the following “related news” towards the end of her report. On Saturday a six-year-old Palestinian boy was shot in the stomach near the West Bank city of Qalqilya. Israeli forces allege the boy was playing with a gun when it misfired injuring him. Remarkably, what was dismissed by even Haaretz – and even ‘Palestinian sources’ – as a likely hoax was elevated by the Guardian reporter to a “he said, she said” narrative, giving equal weight to both accounts. Though we’re of course all too used to such Pallywood-style Palestinian fabrications, serious media outlets have the responsibility to distinguish between such wild, unverified claims and those which may have merit. Shuttleworth’s credulousness in the face of such a fanciful tale does a disservice to her readers and serves to inflame an increasingly volatile regional conflagration. The Western media deserves lots of blame for the actions of Palestinians. Full stop. Please don’t generalise in your statements about the British. I’m an English Jew and it saddens me to read such comments. My grandparents were made very welcome here during the 1930’s, and my family has always prospered. The BBC along with the Guardian are notoriously anti-Israel, and even anti-Semitic. People complain all the time about their heinous reportage to no avail. There are a great many British people who support Israel and are disgusted by the UK media. Most view the influx of migrants into Europe with dismay and mistrust, and view Israel as the only democracy in the Middle East. Make no mistake, you do have a lot of friends here, and the above comment is not only wrong, but insulting and sad. Gil, thank you. There are many normal people here in England who have no animosity towards Jews or most religions. But there are people such as me who don’t trust muslims, or want them living amongst us . in fact, as a Christian, I am more fearful for my safety. In my own country. Please complain to the Guardian …. WOW the Guardian again promoting Pallywood lies, just like they did with the Jenin massacre hoax in 20001. Did the Guardian retract their lie that Jews shot the Arab boy. That the boy made it up. AKA Pallywod. I’ve just realised. That muslim monstrosity is actually an Inuit construct – it’s really called the Alaska mosque. It’s typical of the kind of “human rights” masquerade the Guardian indulges itself in. Sharon was then the interim leader of the Likud and leader of the opposition, not PM. Guardian corrected the article. It now includes this: This article was amended on 7 October 2015. An editing error meant it was stated that Ariel Sharon was prime minister of Israel when he triggered the second intifada by visiting the flashpoint Jerusalem religious site known to Muslims as the Noble Sanctuary and Jews as the Temple Mount. He was the leader of the opposition Likud party. This has been corrected. And yet no comment from the Guardian regarding the sheer stupidity of starting a “Revolution” because a Jewish man walked around a Jewish holy site right before the Jewish High Holy Days. Par for the course, of course. It was not ‘triggered’ by the visit. That is a notorious canard in itself. Arafat planned the intifadah long before that visit.